Find hotel near Arc En Ciel Bora-bora - V ..
Who doesn’t love pearls? And when you are travelling to the pearl islands of Tahiti, this store is one the best places to shop for Tahitian Black Pearls. Pearl experts from GIA (Gemmological Institute of America) craft the selective pieces and the prices are suitable to your pockets as well! The warm staff will be more than delighted to give you a tour of the pearl farm! How popular is Arc En Ciel Bora-bora - Vaitape? People normally club together Raanui Tours and Bora Bora Photo Lagoon while planning their visit to Arc En Ciel Bora-bora - Vaitape. Purchased beautiful pearls last April and lost my receipt. Contacted Arc-en-ceil 9 months later. Heiura Leverd provided the information in a prompt, professional way. Not only do they have great pearls but wonderful customer service as well. Don’t go anywhere else!! Mimi and staff here treat you like you’re buying a Aston Martin!! They pick you up for free from the landing in Vataipe and take you back. Otherwise it’s a looooooong walk to get there. They are so welcoming and educate you on how their pearls are made and harvested so you know exactly what you’re buying. They explained in great detail the differences in the pearls that determine quality and price. The pearls also get GIA certificates. My husband purchased absolutely stunning A quality peacock color earrings for me as a honeymoon gift. Dream come true!!! I loooooooove them!!! If you want quality pearls and service, go here!! We highly recommend this family owned and operated business. Very Friendly staff. The girls were awsome from A to Z. 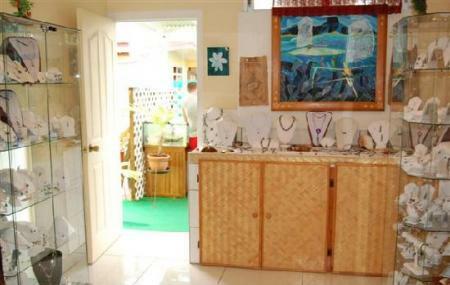 It isTHE BEST PEARL SHOP in Bora-Bora. Service très professionnel et courtois. On a pris le temps d’expliquer les qualités à rechercher dans une perle. Par contre les prix sont un peu plus élevés mais c’est normal si on tient compte des services offerts comme par exemple le service de transport en Mercedes, bref tout se paie dans la vie, ici on en a pour son argent. Bon accueil. Service efficace La vendeuse Cindy à tout fait pour nous aider à trouver la parure dont nous rêvions.Un grand merci.